This residential block was designed to house people living alone. 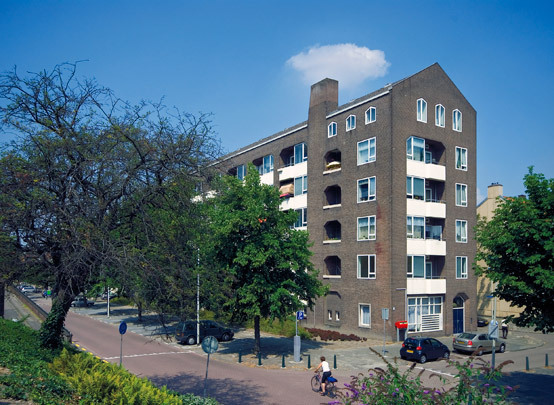 A limited entry competition was won by the husband-and-wife team of Pot, whose main focus was special housing and who later became famous for designing the Over-Amstel prison complex in Amsterdam. The building has four storeys of standard floor plans and one of guest rooms. A steeply ascending concrete pitched roof and internal balconies serve to unify the whole. The entrance is at the head end, with access galleries at the rear of the building. Typical features of the exterior are the articulated rounded ends of the loggias, the uppermost window bands and the hexagonal windows in the stairwells.